Cross Encounters: Evangelist: Are You Loving Your Wife? Evangelist: Are You Loving Your Wife? "Husbands, love your wives, as Christ loved the church and gave himself up for her, that he might sanctify her, having cleansed her by the washing of water with the word, so that he might present the church to himself in splendor, without spot or wrinkle or any such thing, that she might be holy and without blemish In the same way husbands should love their wives as their own bodies. He who loves his wife loves himself. For no one ever hated his own flesh, but nourishes and cherishes it, just as Christ does the church, because we are members of his body." Some of my Christian brothers who will read this post are blowing it with their wives. I know this is true because I've watched them do it. I know this is true because some have confessed as much to me. I know this is true because I've talked to several wounded Christian wives over the years. And I know this is true because I've blown it, too. I've been a Christian for 25 years. But the evangelistic light bulb didn't go on until 2002--just 11 years ago. It would be another two-to-three years before I realized that God had wired me and called me to serve Him as an evangelist. Overnight it seemed that my zeal exploded, even though it took several years to develop. I had thought God wanted me to spend my life serving Him by serving my community, as a deputy sheriff. 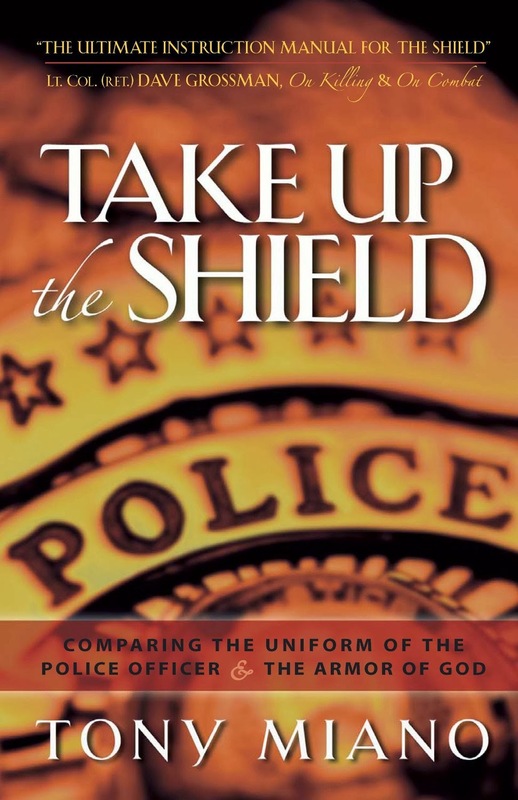 While I cherished the twenty years I served in the law enforcement profession, as both a deputy sheriff and a chaplain, I came to realize He had something different planned for me. I thought His plan was for me to plant a church and stand in a pulpit the rest of my days. I loved and appreciated my time, although brief, as a pastor. I loved my tiny flock. I loved doing the heavy spiritual lifting of studying for, preparing, and preaching sermons to my congregation. But after just 18 months the Lord made it more than evident that my time as the shepherd of a little flock was preparation for something else. 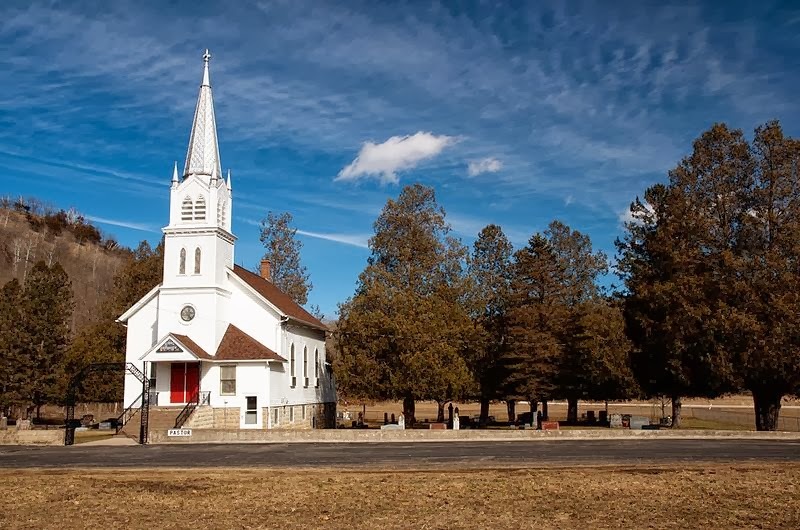 When the Lord closed the doors of our little church plant, I thought His plan then was for me to serve Him as a missionary to the law enforcement community. For six years I ministered to the men and women of my department and to members of the law enforcement community throughout North America and around the world. I loved it. It was a joy to climb into the front passenger seat of a patrol car for the expressed purpose of ministering to the man or woman in the driver's seat. Many heard the gospel. But I began to grow restless. Serving as a chaplain was never boring. I never tired of being in the field with my law enforcement brethren. The restlessness was the result of a desire to proclaim the gospel to more people, in more places, more often. So, in order to address the restlessness within, I began to augment my work as a chaplain with time on the streets bringing the gospel to the general population. I remember my first open-air. I had nagged Ray Comfort and Stuart Scott from Living Waters for what seemed like months, as I vacillated about whether or not I should climb atop a box and herald the gospel in the open-air. Distributing gospel tracts and engaging strangers in one-to-one conversation had become as natural as conducting a traffic stop of a suspicious vehicle. But the thought of standing on a box and preaching in public scared me much more than facing a group of armed gang members at the far end of a dark alley. Ray and Scotty's counsel was simple enough. "Set aside your fears and just do it." Well, there was no way I was going to open-air preach in my neighborhood. I was convinced that someone with whom I had worked patrol would be called to my location and they would cart me away as a "5150" (mentally ill person). If I was going to get arrested or locked up for a 72-hour mental evaluation, it wasn't going to be at the hands of people with whom I shared a patrol car. I picked a spot in a quiet beach community, about sixty miles from home. I found a nice, quiet park along the beach, in San Buenaventura. If I blew it; if the world fell apart, no one back home would likely ever hear about it. I convinced my lovely wife Mahria and my youngest daughter (then about eleven years old) to go with me for my first open-air. I paced around the canopy for about an hour, trying to muster the courage to climb atop the box and proclaim the gospel. Finally, I turned to Mahria and Amanda and said, "I need the two of you to go gather a crowd." They looked at me as if I had handed them a gun and said, "Here. Take this. And go rob those people playing in the playground." "What?" Mahria gasped. Amanda, with a frightened look on her face just shook her head. "Look. Unless you two help me draw a crowd, we're going home. And we would have driven all this way for nothing." "Tell them that the guy at the easy-up is going to give away money to people who can answer trivia questions." Mahria took Amanda by the hand and the two of them, with heads hung low, drug themselves toward the beach. And then I had a brief and oh-so-spiritual conversation with my Lord. "Lord, you've got ten minutes to draw a crowd. If there isn't a group of people standing here in ten minutes, I'm going to take that as a sign I shouldn't be here and that I shouldn't open-air preach." It was as if my fear had caused me to erase from my mind, or just ignore, years of Bible study, training, and spiritual growth. And I waited, almost hoping the Lord would not provide a crowd. I wasn't sure at that moment if I should thank the Lord or kick myself for praying that short, almost blasphemous prayer. I looked at Mahria. For a moment she seemed to have a look on her face that said, "Well, mister. I did my part, now get up there and do yours!" I would learn later that the look (more like a glare) was a look of encouragement, not anger. I stepped onto the box. I hoped the crowd couldn't see my knees shaking. But they must have seen them shaking because it felt as though there was a 6.0 magnitude earthquake rocking the ground directly under my box. I began, as promised, by giving away dollar bills for correct answers to trivia questions. Then I offered a $5 gift card to In-n-Out Burger to anyone who could prove to me they were a good person. Several hands shot in the air. I selected a young man to take the "Good Person Test," which afforded me the opportunity to share the Law and the Gospel with him and the crowd. When I finished preaching, I felt as though I had just been in a race. I was breathing heavy. My heart was pounding. My forehead was sweaty. I looked at the crowd in front of me. No one was leaving. I felt like saying, "Okay. That's all I've got. You can go now." Then some of the people in the crowd started to ask questions--good, sincere questions. Some of them wanted tracts. Others accepted Bibles. This time when I looked at Mahria I think there were tears in her eyes. I think there were tears in my eyes, too. As I've seen the Lord do for so many others, the Lord blessed me with a wonderful first open-air. It was at that moment that I realized who I was in Christ and how He had wired and called me to serve Him. I remember praying and asking the Lord to forgive me for years of utter failure in evangelism. And I thanked Him for His grace and mercy, and for allowing me to preach His gospel in the open-air. What was a wonderful moment for both me and Mahria was also the start of a rather rough patch in our relationship. As I already mentioned, I reached a point in my life where my zeal for reaching the lost with the gospel of Jesus Christ exploded. I ate, drank, slept, lived, breathed evangelism. I still do, but the outward manifestations of the explosive zeal have been tempered by time and maturity (although, in the minds of some, the jury may still be out on that one). The mistake I made, the sin I committed was that I expected my wife to not only support my new-found zeal, but also share it. Mahria has been a Christian as long as I have. Only one short month separates our spiritual re-births. But Mahria and I are very different people. And our spiritual walks have ebbed and flowed at different paces, reaching different places of maturity and application, over the last two+ decades. My wife is the most selfless person I know. The only time she puts herself before her family or before someone else who needs her help is if she is compelled by others to do so. While I know she will disagree, Mahria has the patience of Job. She is quiet and unassuming. While she sings like an angel and has spent much time on stages with a microphone in hand, her preference is to be behind the scenes. She is most comfortable in a supporting role. My wife is not perfect, but she is the perfect wife for me. She epitomizes a love expressed by Jesus in John 15:13. "Greater love has no one than this, that someone lay down his life for his friends." While I am blessed that Mahria remembers little of my bad behavior during the early days of my street evangelism efforts, it still grieves me to think of how I hurt her and stunted her evangelistic growth during those days. Instead of nurturing her and gently guiding her in biblical evangelism, I placed unreasonable and unloving expectations on her. While I have never expected her to open-air preach, I did expect her to distribute gospel tracts and engage people in spiritual conversations with the same frequency and fervency that I did. Whenever I had an opportunity to hit the streets, I expected Mahria to jump at the chance to join me. And when she didn't, I made her feel guilty with a disapproving glance or an uncharitable word. I was wrong. I was so very wrong. Over time, by God's grace and through candid conversations with Mahria, I came to realize the error of my ways. And time has healed whatever wounds I inflicted upon my bride regarding evangelism. Since that time Mahria has begun to blossom in her evangelism efforts, at her own pace. She's less hesitant to hand somebody a gospel tract. She's less hesitant to broach spiritual issues in her day-to-day conversations. When her schedule permits (now that the children are all adults, and now that we've returned to a life of support raising, Mahria works full-time outside the home), she will come out with me when I hit the streets. Beyond that, one of her favorite forms of evangelism is placing tracts in the self-addressed, no postage required envelopes that come from bank and credit card offers. My hope is that my Christian brothers who read this will see the counsel I am trying to provide through my testimony. But for those brothers in Christ who miss the moral of the story, allow me to be blunt. If you are presently making the mistakes that I once made with my wife, if you are placing unreasonable and unloving expectations upon your wife in the area of evangelism, knock it off! Love your wife more than that! Love your wife as Christ loves the Church and gave Himself up for her! Do you want to see your wife grow in her passion for reaching the lost with the gospel? Then pray for her. For it is only God, through the power of the Holy Spirit, who can give her such a heart for evangelism. 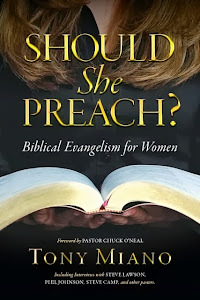 You can no more make your wife an evangelist than you can make yourself an evangelist. Do you want to see your wife grow in her passion for reaching the lost with the gospel? Then give her opportunities to learn how to share her faith; but do so in such a way that she feels safe to grow at a pace that is consistent with who she is in Christ. She shouldn't be afraid to learn from you--afraid that if she learns something new you are going to immediately expect her to apply what she has learned at a level consistent with who you are instead of who she is. Do you want to see your wife grow in her passion for reaching the lost with the gospel? Then be her biggest cheerleader. But do it in such a way that doesn't leave her cringing, as she wonders if you are going to say, "That was great, honey. Now you're ready to try this!" Don't patronize your wife. Rather show her genuine support wrapped in authentic praise, reminding her that the size or scope of the evangelistic effort is not as important as the love for God and the love for people that went into the effort. Are you an open-air preacher? Then let your wife see that the one tract she handed out today is every bit as important as the forty minutes you spent preaching to fifty or a hundred people. Do you want to see your wife grow in her passion for reaching the lost with the gospel? Then make a point of regularly thanking your wife for the way she supports your evangelism efforts (if she does). Make sure she understands that the two of you are an evangelism team, whether or not she is with you on the streets. Share your stories with her; but do so in such a way that makes her feel a part of the effort, and not on the outside looking in. Do you want to see your wife grow in her passion for reaching the lost with the gospel? Then don't make the mistake of allowing evangelism to become the "other woman." Spend time with your wife and have conversations about topics other than evangelism. Talk to her about her. And listen to her. Be willing, with joy in your heart, to not hit the streets in order to minister to your wife. Love Christ more than you love your wife. But love your wife more than you love evangelism. Do you want to see your wife grow in her passion for reaching the lost with the gospel? Then if you have made the mistakes I once made, repent. Seek the Lord's forgiveness and then go seek the forgiveness of your wife. Let her see real humility and show her the same kind of sacrificial love Christ showed for His Church when He laid down His life for her. Men, if you struggle to love your wife the way Christ loves the Church, what makes you think you can love the Church the way Christ loves the Church? What makes you think you can love the lost the way Christ loves the lost? If your house is not in order--her fault your fault, it doesn't matter--then you must prayerfully and honestly consider whether or not you belong on the streets proclaiming the gospel. This is not to say if there are struggles in your marriage you shouldn't share the gospel with your friends, fellow students, co-workers, or the stranger in line at the grocery store. However, to engage in open-air preaching or pleading outside an abortuary, to put yourself in an environment where your love for people will face some of its greatest tests, to presume to lead other Christians in evangelism (if that is where you find yourself) when, at present, you are unable to lead your own family--to engage in any of these activities if your house is not in order, if your marriage is struggling, is foolish. Open-air preaching and street evangelism when there is marital strife at home is also spiritually dangerous. With such a weak link in your spiritual armor as a marriage in trouble, putting yourself on the most intense spiritual battlefields opens yourself up to horrendous, potentially life-altering attacks--more intense attacks against your marriage and your integrity. Open-air preaching or any kind of organized, concerted street evangelism effort, if engaged when there is significant trouble at home, can make the evangelist susceptible to "the desires of the flesh and the desires of the eyes and pride of life" (1 Timothy 2:15). Sin begets more sin. The additional, ever-present temptations so prevalent on the streets, striking at times from ever conceivable direction, can lead to even more disastrous sin. And any man who thinks "It will never happen to me" lacks the requisite wisdom and discernment to tie his own shoes, let alone to engage formidable fleshly and spiritual foes on the streets. If you are an open-air preacher or a street evangelist and your marriage is struggling, or flat-out in trouble, stop preaching. Get off the box and get on your knees. Never forget your wife is your first ministry. Reconcile with your bride. Die to self. Choke on humble pie if you have to, even if your wife is the one who should eat the first piece. Can any man say he is walking humbly with his God if, with either animosity or indifference, he refuses to be reconciled to his wife. If you're unwilling to fight for your marriage, then any fighting you do in the name of Jesus Christ is nothing more than a hypocritical facade. For God has commanded you, in His Word, to love your wife as Christ loves the church. And it is a command without condition. Look closely again at the text. Notice the passage doesn't say, "Husbands, love your wives, as Christ loves the Church, unless....." It doesn't say to love your wife unless she is unsaved. It doesn't say to love your wife unless she is not supportive of your evangelism efforts. It doesn't say to love your wife unless she sins against you. As Christian men, evangelist or no, we are commanded to love our wives. Period.